Chic up your social network. Elegant textures create looks rich in style, intrigue and imagination. Fashionable prints take flight at The Flamingo. A Roman goddess rocks the season’s hottest styles. Fashion with a little je ne sais quoi. Fall creates a new fashion dimension. Effortless French style photographed at Paris Las Vegas. Celestial-inspired gowns fit for a Greco-Roman goddess. Japanese-inspired fashions photographed in the Nobu Villa. Today’s fashions flashback to the ‘70s. Fashions to whet your appetite. A love affair with fashion. Out of this world fashions on the High Roller. 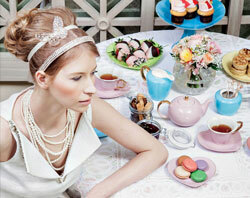 Sweet treats and fancy frocks make for a perfect afternoon tea. Rockin’ fashions with an edge that will be the hit of the post-show party. All-American style that’s so country cool, every cowboy is taking notice. The wedding gown gets a refreshing, contemporary twist. Add a bit of Brit to your appearance. A revealing look at spring’s sexiest lingerie. Lush looks and gorgeous gowns make for a fashionable garden party. Candy couture. The season’s best and brightest fashions pop in a sugar shop setting. Score some style points with the crisp look of preppy chic. Photographer Jerry Metellus captures our Barbie-like beauty in a playful Jonathan Adler-designed suite.